Editor’s Note: We were saddened to learn that Dr. Sophia Yin passed away on Monday, September 29, 2014. Her work with this team and pet owners everywhere was inspirational. She will be sorely missed. 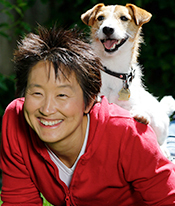 Dr. Sophia Yin is a veterinarian, applied animal behaviorist, and the author of many books, including Perfect Puppy in 7 Days, How to Behave So Your Dog Behaves, and Low Stress Handling, Restraint and Behavior Modification of Dogs & Cats (book and DVD). She sees behavior house calls and lectures and teaches workshops on animal behavior, training, and low-stress pet handling in the U.S. and internationally. She writes for a number of veterinary and popular magazines, and for five years running was the award-winning pet columnist for the San Francisco Chronicle. She has consulted for several zoos and served as a behavior expert for TV shows such as Animal Planet’s "Dogs 101." Dr. Yin’s mission in life is to improve our understanding of animals and their behavior so that we can care for, appreciate, and enjoy our time with them better. Learn more at her animal behavior website, drsophiayin.com.